17 November, 2016 – Berlin, Germany: Uberchord Engineering GmbH today announces just weeks following the conclusion of the highly acclaimed Abbey Road Studios Accelerator Program that it has secured a licensing agreement with Universal Music Publishing Group. The company, which has received seed financing from an international group of business angels, Ebner Publishing Group and London-based Passion Capital, is developing unique mobile apps for music instrument learning. Their mobile app is different from all other music education apps in that it actually listens to a user’s playing, gives meaningful feedback and motivates the user with daily tasks and goals: Uberchord not only tells users and students how to press the right strings, but literally teaches them how to play music – like having a personal tutor in your pocket! The company’s patented and pioneering audio recognition technology is completely unique: Rather than simply detecting whether a chord is right or wrong it can identify the individual notes within a chord being played precisely enough to give players meaningful, accurate and instantaneous feedback on their performance. Uberchord’s ChordSense(TM) technology “listens” to the player through the iPhone’s microphone and analyses the audio in real-time on the phone itself. The precision of the technology allows the app to gain a detailed understanding of exactly what mistakes the user might be making. That in turn allows the app to provide detailed feedback, showing not only whether the player has done something wrong, but even specifically details which fingers might be in the wrong position. 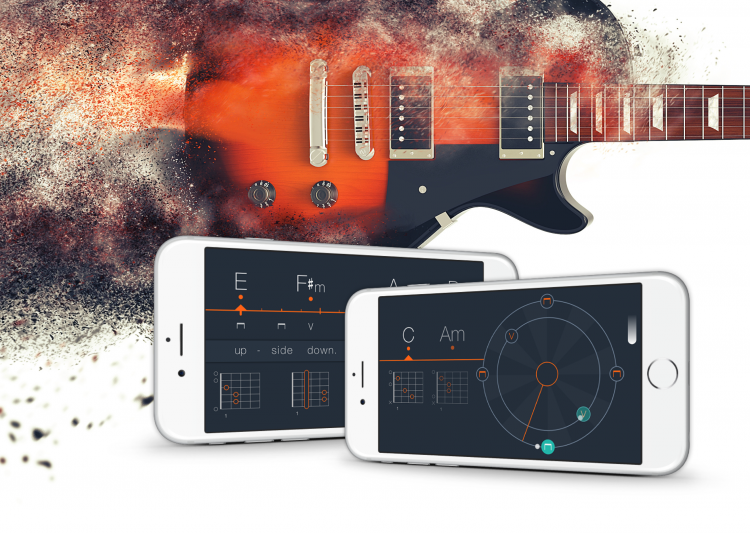 Building on their current position Uberchord are now expanding their guitar chord trainer app into a personalized guitar learning platform, across web and mobile, to truly bring music education into the 21st century. Towards that goal, the company is announcing today a new partnership with Universal Music Publishing Group, which enables Uberchord to feature high quality chords, rhythm and lyrics for all songs from the extensive Universal catalog on their website and as fully interactive courses in the upcoming version of their mobile app. Official release will be on November, 17th (https://itunes.apple.com/app/id952669753). The new app also features the world’s first dedicated rhythm trainer for guitar giving instant feedback on strumming. The accompanying music platform will go live shortly and Uberchord is looking forward to announcing further partnerships in the coming months to keep enhancing their users’ learning experiences. 85% of people who try to learn how to play a musical instrument give up and quit within the first year, and Uberchord is hoping to change that for the better. Commercially the music learning market is worth more than $12 billion globally and the company’s leading technology and best-in-class partners positions it to service future players better than any other service. Launched in October 2015, Abbey Road Red is Abbey Road Studios’ open innovation department designed to support the endeavours of the brightest music tech entrepreneurs, researchers and developers. Abbey Road Red runs a unique music tech start-up incubation programme – the first of its kind in Europe – to support the most promising music tech start-ups, as well as collaborating with the brightest minds in academic research.